This month the Movie Club will be screening the original film of teenage angst Rebel Without a Cause. Directed by Nicholas Ray, the film stars Natalie Wood, Sal Mineo and James Dean in a career and generation defining role. Jim Stark (Dean) is new in town, but even before he attends his first day at school he is picked up by police on a drunkenness charge. His parents come to get him out, and the juvenile division officer learns of Jim's anger at the constant bickering of his parents. There he also meets Judy (Wood), who gets herself into trouble to try to connect with her seemingly disinterested father, and Plato (Mineo), who comes from a broken home and was arrested for shooting puppies. At school things don't improve. Although Plato becomes fascinated with Jim and tries to befriend him, and Jim tries to connect with Judy, her boyfriend, Buzz, and his gang don't take to kindly to Jim, resulting in a knife fight. Buzz eventually decides to settle this with a chicken run. From there all three find themselves becoming involved in ever more problematic behavior spiraling out of their control. The film's power lies in its seeming inability to describe what is causing the youth to 'rebel'. There is an uncertainty that permeates all the actions, with questions "why do we do this?" or "what can you do when you have to be a man?" All attempts at answers are unconvincing, with some giving up simply by admitting "I don’t even know why I do it", and others attempting to provide weak although compelling reason like "you've gotta do something." 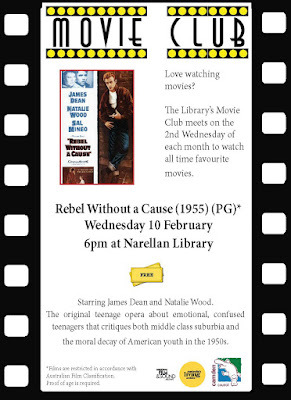 The film will be screened on Wednesday 10 February at 6pm at Narellan Library, Corner of Queen and Elyard Street, Narellan. Tea, coffee, and biscuits provided, but BYO snacks are more than welcome. Stay after the screening to chat about the many uncertainties and questions the film leaves unanswered. Share your thoughts or use the discussion questions.